The world-class leader in the field of flash memory and consumer electronics, Transcend has recently announced the launch of its new JetFlash 220 USB thumb drives come equipped with biometric protection. With an unique built-in finger print sensor which embedded on the JetFlash 220, you can protect and access your private/valuable data by simply scanning your fingerprint. Besides, this USB flash drives also features AES 256-bit encryption technology, driverless operation (Windows 2000/XP/Vista) and fully USB 2.0 compliant for high speed data transfer. In addition, this amazing thumb drives also allows users to automatically log on to web sites (Microsoft Internet Explorer only) for which they have a registered account. 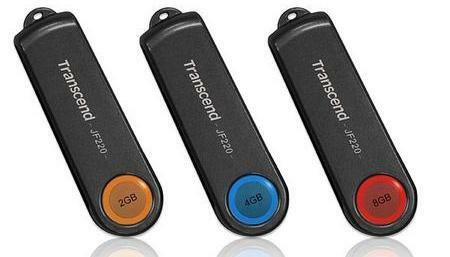 The new Transcend JetFlash 220 USB thumb drives that available in 8GB (Ruby Red), 4GB (Royal Blue), and 2GB (Sunburst Orange) versions are come with a two-years warranty but no words on its price yet.